Maria is the co-founder and data scientist at Orb Intelligence, a Palo Alto company that provides business information for marketing software vendors and B2B marketing agencies. She is responsible for data crawling and system integration and designs algorithms to make use of the data for B2B marketing tasks. Maria works closely with clients of Orb Intelligence, companies like Lattice Engines and Hubspot to integrate the data into marketing software for predictive lead scoring, prospecting, personalized lead nurturing and reducing customer churn. Maria explains how previous data integration and data connection experience at her previous startup, Teralytics, and search engine building experience at Yandex (the Google equivalent in Russia) was instrumental in creation of the B2B predictive data provider, Orb Intelligence. Orb Intelligence provides the firmographic data for predictive analytics companies building on top of SalesForce (ex: Lattice Engines, SalesPredict). These PA companies take data from CRM's (SalesForce, Oracle, Microsoft Dynamics CRM) as well as data from marketing automations software (ex: Marketo, Hubspot) and then integrate it with 3rd party firmographic data like Dun & Bradstreet or Orb Intelligence. They then build a 'unified customer profile'. After integrating data from many sources they build predictive models. Why predictive marketing has taken off in the last 12 months (19:40). How much data does a company need to have to be able to use predictive analytics (21:40). Steve: Please tell us a little bit about your journey and how you started Orb Intelligence. Maria: Yes, so me and my co-founder, Maxim Grineva, we were working with data integration and collecting data from many sources and building some kind of… and different kinds of analytics on top of it. So we have been doing it for many years. And my previous company, Teralytics, we were working with Hadoop and big data from large companies like Credit Suisse and build analytics on top of it. And then we had this very useful and kind of basic experience when we were working at Yandex. So Yandex is a Russian search company and its similar to Google in Russia. So it's like the leader for web search in Russia. And they built a very similar system for web search. And at Yandex, we got very useful experience with web search. So we've built a system that collects data from the web and that also collects data from social networks and we build the search for this data. And after some time at Yandex, we realized that we want to build our… we want to leave for our next company to start a new start up. And we also realized that we want to build a B2B company because it is easier. I believe it's easier to be a startup now for B2B because you can get clients one by one relatively early and start generating revenue relatively early and bootstrap on this revenue. So we used our experience with data collection. And at that time, Maxim was researching this field that was growing based on Salesforce. So Salesforce, they built a very interesting ecosystem of companies that do analytics on top of Salesforce data. And we realized that we can be useful in this area because we can be a data provider for sales and marketing. And we also can go with B2B model by providing the data to those companies that build analytics on top of sales force. And then we started researching closely and we saw that there are many companies that build so called “predictive analytics” for marketing. And what they do is that they take data from CRM like Salesforce from Oracle or Microsoft Dynamics CRM. And they also take data from marketing automation systems such as like Marketo, for example. And they integrate this data and then they acquire 3rd party data of companies like for example from Dun & Bradstreet. And they built a unified customer profile. And as soon as they integrated all the data from many many sources about customers, they can build predictive models. And those predictive models are used for many tasks; so for example, they can be used for lead scoring, opportunity scoring or predicting customer’s churn and also generating new leads, new prospects. 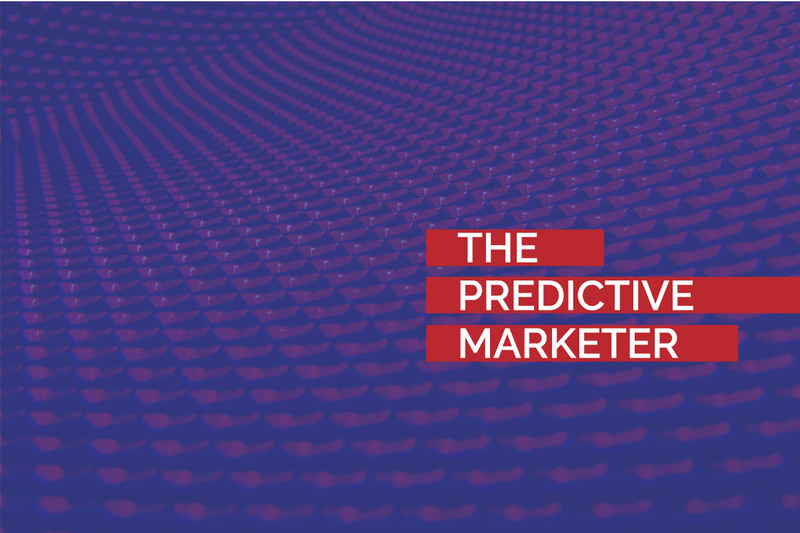 And so we started talking with these companies and our first client was Lattice Engines, the company that builds predictive lead scoring and also now they build… they can predict opportunity scoring and predict customer churn. And they already have been quite a while in this field, for many years and they became our first customer. So what they do is that they take data about leads and they enrich this data with our data. So for example, if they have a lead email, they can get information about the company from our API by company name or by company email domain or company URL. And then for example, when they know the size of company and they really knew the location and industry, it's very useful to build predictions on top of this data. Steve: Let me ask you this: you and I spoke the other day about how there's a lot of hype in the industry right now, overuse of the adjective “predictive” and very little understanding of the different players in the industry -- what they do and the purpose they serve. Can you kind of give us an overview of the different types of companies in predictive marketing? Maria: Well, yes, it's true. The field is very busy and there are many companies that recently raised a lot of venture funding for this. And that is really… it's a little bit too hard to understand who is doing what. And so the most popular use case for predictive analytics, as I see it, is lead scoring. So recently, more and more B2B companies started to sell over the web, on the internet, and they somehow… they are now going a little bit into this B2C style. That means that they advertise themselves on the internet and they also prepare a lot of content about their products and services. And they arrange webinars and also offline conferences and they generate leads that come to their website. And then when these people that somehow read an article or a blog post or some kind of content or saw the advertisement, they come to the website and they register in the web form. And from this point, the company needs to score leads because there are many leads, you can’t call everybody and you need to understand… you need to first qualify the leads and to understand the propensity of them to buy; to understand who will probably buy or become a customer. And for this case, list scoring is very useful. So companies like Lattice Engines, they take leads, that the information about leads that appeared through the web forms and they score it. And then in site sales of a company can just call those leads with the highest scores. And so this is probably the most popular use case of predictive marketing. But also there are companies that help with the lower funnel. And they also can predict… they also work with the opportunities and they predict how the opportunities will go, how soon they will close and what will be the total revenue for the company by the end of the quarter, for example and so on. And also, there are a lot of companies that help with customer churn. This is especially useful now because a lot of software is now SaaS. They choose the SaaS models -- Software as a Service. And then by design of this model, they deal with a lot of churn. When you have too many customers, it is difficult to follow everyone and to understand who is using your product or who has problems and who will leave very soon. And this predictive analytics is very useful because it automatically collects data about product usage. And about different customers and also external information about what's going on with those customers; maybe they will acquire it or they have some problems or the executive team changed. And based on all of these information, they can suggest customers to whom the company should pay most attention. For example, GainInsight. So there are many companies who do similar things that GainInsight does like for example, Tatango and Bluenose and I'm not sure, but probably Lattice also has this kind of functionality now because they're extending it recently. 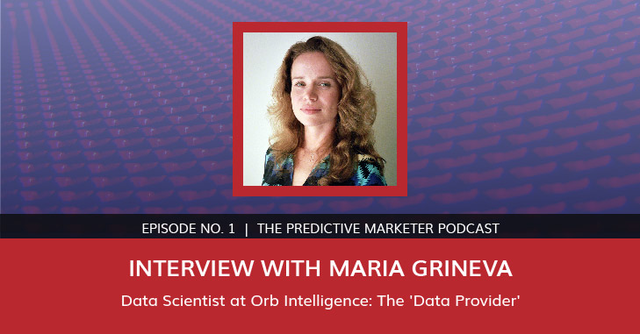 Steve: Welcome back to our interview with Maria Grineva with Orb Intelligence. So in predictive analytics, you have three company types; as I understand it, you’ve got your data aggregators, your data enrichers and your predictive modelers. How would you describe Orb INTELLIGENCE? Maria: I wouldn’t call us data aggregator because we actually built the database from scratch. We call ourselves “data provider.” And we are different from many other data providers because we’ve built the data ourselves. We don't use someone else’s data. But yes, in general, you are right. So there are… I would divide this field into those who provide the data and those who build applications on top this data, like analytics on top of this data. Steve: Can you give us a little more detail about the type of data, the types of data that you provide? Maria: We provide very basic company information. It's called “firmographics.” So it's such information as company name, website, industry, revenue, number of employees, office locations and so maybe sometimes social networks and other specific fields too, but we specialize in basic firmographics. So probably our competitors can be Dun & Bradstreet, that have been doing it for many years. But also, there are other data providers that provide specific information about companies. Like for example, H2 Data, they collect information about what technologies and what software companies are using. Like for example, they can give you a list of companies that use Oracle or a list of companies that use Hadoop, these kinds of technologies that they use inside. Steve: As a data provider, how does Orb Intelligence differentiate itself from the competition? Maria: Well, it's a good question. So we differentiate in this way that we’ve actually built our database from scratch. We don't resell it. And we are based on a technology that collects data from many sources in real time. So we constantly crawl the web and companies’ websites. But most importantly, we're based on government filings. So we collect data on many levels; we collect data from government at the federal level, at state level and also at city level. And as soon as the governments publish a new information about companies registered, we get this data and integrate it inside our database. And as a result, we have information about very small and new businesses. And this is rare because companies like Dun & Bradstreet, they have information about companies that already grew to some point and they register to receive a Duns number. But we actually get information about the company and incorporate it as soon as it got some kind of a city license… business license at a city level so we get information about this company very early. And this is important for our customers who will build analytics for S&B’s who deal with very small businesses and they need information about them. Also, our differentiator is that we have a really convenient API. So we have a very simple and flexible API where you can fetch information by company, email domain, URL, name and whatever information you have about this company, you can find it in our database automatically and build a system that would process leads in real time. So we’ve built a database of all American companies and we provide access to this database via our API. And then our clients, like for example, SalesPredict, they already work with companies… they work with marketing in those companies. And they enrich the information about their customers from our database. So what we built is just a general, very big database with information about all American companies. Steve: Could you give us a very specific example of how one of your customers uses the data that you provide? Maria: Yes, sure! So let’s take for example our client, SalesPredict. They are building predictive leads scoring. And for example, they work with a customer (it's their own customer) and they have this customer to score their leads. So they take a list of leads from their customer’s marketing automation and this list of leads, it's probably just emails from people who registered on their website. And then they go to our API and fetch the information about the companies where these people come from. So for example, you have someone from John@Omniture.com registered on their website to receive more information about the product. So then, SalesPredict gets this email and requests our API and gets the information about Omniture. And they learn that Omniture is a company from Utah that was acquired by Adobe and now it is a subsidiary of Adobe. And it is a software company and the number of employees is for example 1,000 people. And based on this information, they can automatically, using predictive models, they can understand how well this lead fits for this company. So does it look like their ideal customer? Or maybe Adobe is already acquiring the parent company. Then it is very useful to understand that someone from subsidiary is interested in the product. Steve: Predictive analytics has really taken off in the last 12 months or so. Perhaps you can shed some light why do you think the interest has increased as it has. Maria: Yes. So companies like Salesforce and Marketo, they built very good infrastructures. So they have to automate marketing and sales. So ever since they started with software automation. So they have marketers to send more emails to nurture clients and leads and to automate the sales process and so on. And as soon as this infrastructure were adopted and more and more B2B companies got used to it, it’s now the time to manage the data inside those systems. And normally, companies very soon get a lot of mass and Salesforce in Marketo and they need some kind of help to deal with this data. And to bring some order into it and to build some kind of analytics on top of it. So after the infrastructure is in place, so now it is a good time for the next step for analytics and predictive analytics. And now we see that companies are starting to adopt these predictive analytic tools. And it's still very early because it's very new and still very early, but I believe that maybe it just makes sense as the next step after you got the Salesforce, it just makes sense as the next step to do something intelligent with the data you have in your Salesforce. Steve: There's a certain amount of data required before a company can try to do this. So that kind of eliminates some of the smaller companies from being able to pursue this right now. Is that accurate? Maria: Yes. Correct. So predictive analytics works when you already have a lot of inbound leads and you have for at least around 200 customers and it starts to work when you already have data. But if you're just starting to sell, it's difficult because algorithms need some kind of history to work on. But for new companies, there are other offerings. Like for example, our client LeadGenius, they help you… they build you a list of prospects. So if you don't know whom to sell and you don't have a lot of data internally, they can help you by finding those customers -- those companies that can be interested. Steve: Fantastic! Maria, what's the best way for folks to contact you? Maria: Well, the best way is my email, it's Maria@OrbIntelligence.com. Steve: Well, this has been great, Maria. Thank you so much for being on the show! Maria: Thank you very much! Thanks for your effort and for this project.